The traditional home of the Nansemond Hunters (William Hunter and his descendants) is usually said to be the small town of Alnwick, Northumberland. We don’t know the source of that information, but it is widely accepted. 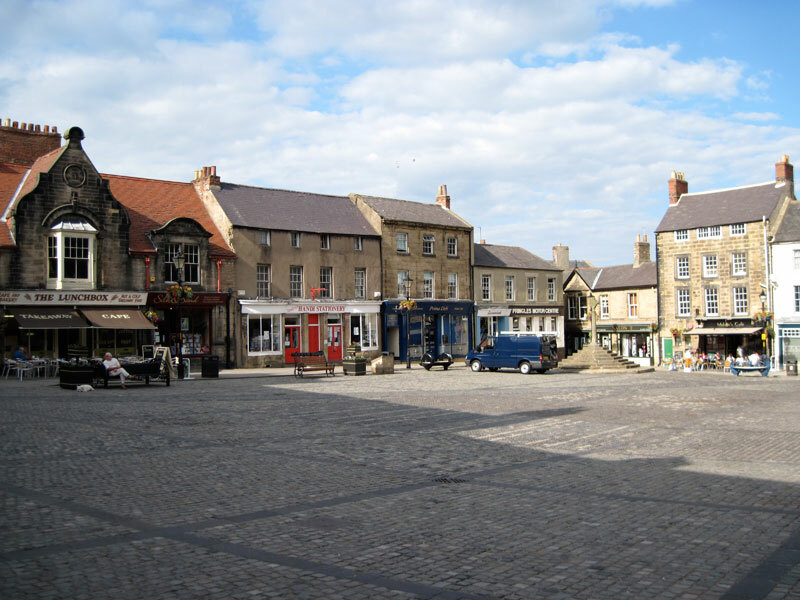 Alnwick is a quiet little village on a hill overlooking a stream the locals call the Aln River. For an American it’s quiet, but during the summer it is a favorite spot for a day trip and can be crowded with British tourists. Once voted the most typical English village in UK, it includes both a castle and a world famous garden. It’s close to the sea, has plenty of parking, and easy access from the highway system. It’s an old place, with both Roman and Viking roots. The Scots and the English fought over it for centuries. William Wallace – “Braveheart” – once burned the town to the ground and both Shakespeare and Sir Walter Scott wrote about the area with varying degrees of authenticity. There are only two main streets, and it can easily walked end to end in half an hour. The market square still exists, and while weekly markets still take place, the costumed “Renaissance fair” events that used to be held for the tourists have ceased. Though most of the buildings are early 19th century stone structures, a map from the late 17th century indicates that the layout of the town itself, with two main streets enclosing a market square has barely changed. A large castle in excellent condition, a very old city gate, a few bridges and a beautiful medieval church still remain from the days of our ancestors. 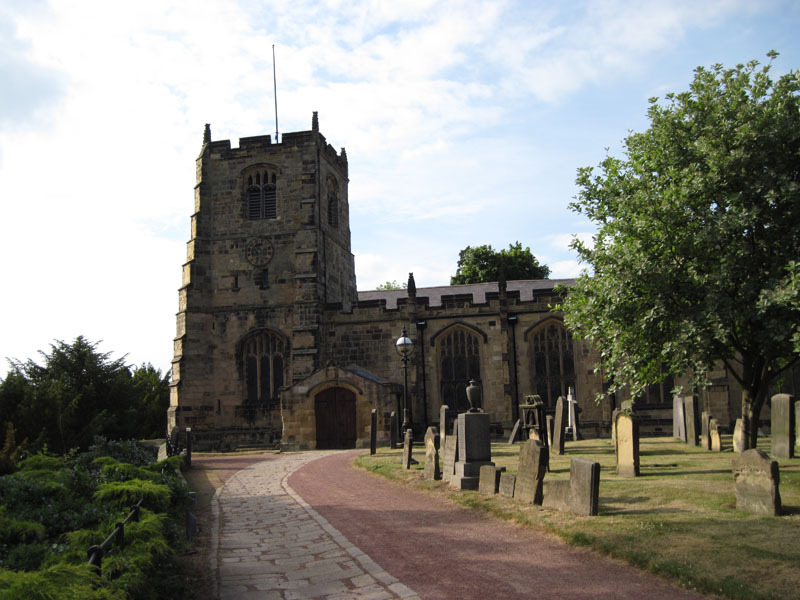 The church, full name “St Michael’s and St Mary’s Anglican Church”, dates to at least 1100, but sits upon even older structures. In the 1400’s it was renovated. It was remodeled again in the late 1700’s when much of its earlier 15th century character was restored. Today it looks much as it would have when our family worshiped here. There’s a well-kept cemetery on three sides of the church. Most of the remaining graves date from the 19th century, though parts of the walkways and foundations of the church are constructed with older, nearly unreadable stones. At least six surviving tombstones have the Hunter name. The most significant is that of Matthias Hunter (d.1665). It is located in the center of the church between the pulpit and the first row of pews. 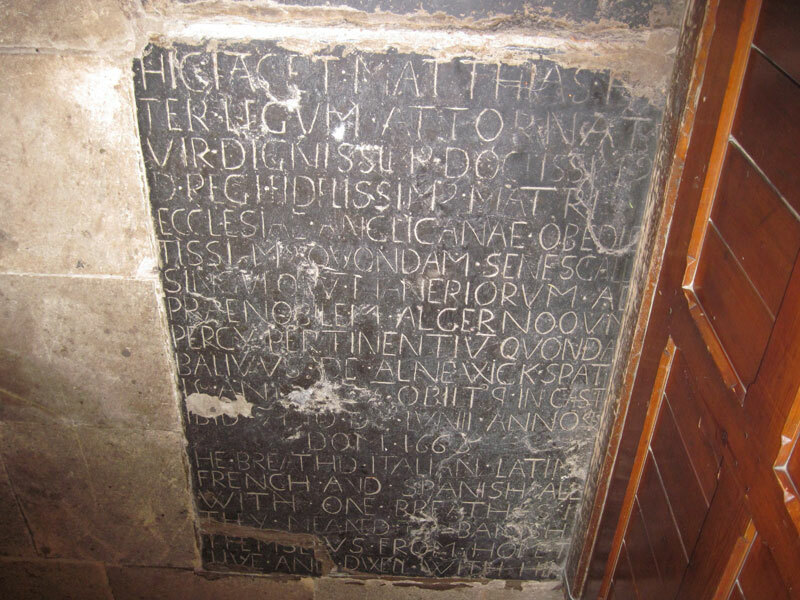 The grave is covered by a 2×3 foot dark stone tablet with Latin and English inscriptions. 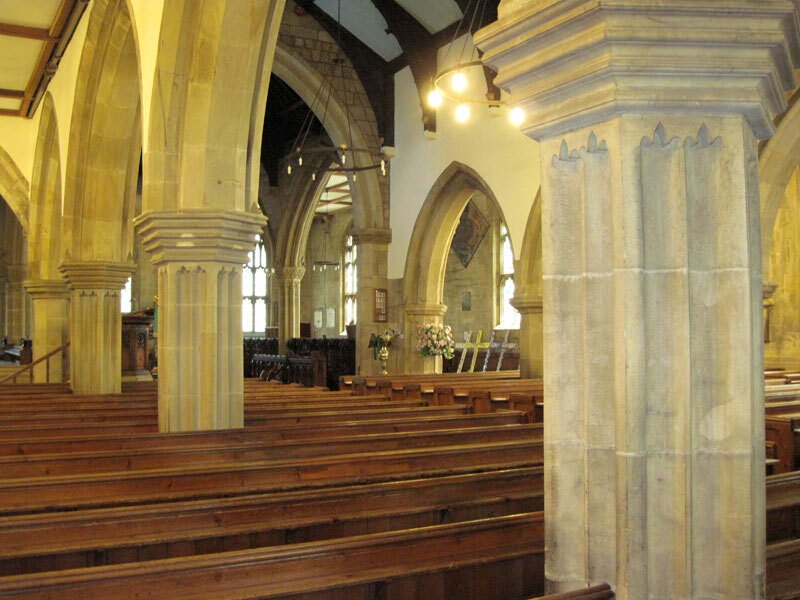 The railing of the front pew overlaps one edge of the stone and obscures part of the text, but by chance, a transcription of the stone exists in Descriptive and Historical View of Alnwick by William Davison (1822), page 192/3. The book can be viewed free of charge on Google Books. 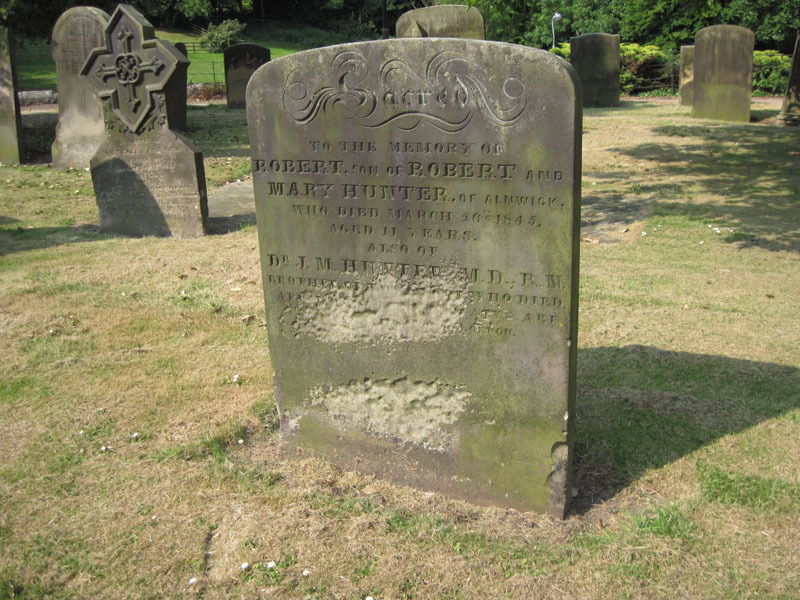 There’s no indication as yet that Matthias Hunter is part of the Nansemond Hunter line, but obviously he was living in Alnwick at the time our family would have been there and he died there about the time they must have departed. That certainly makes him worthy of additional research. 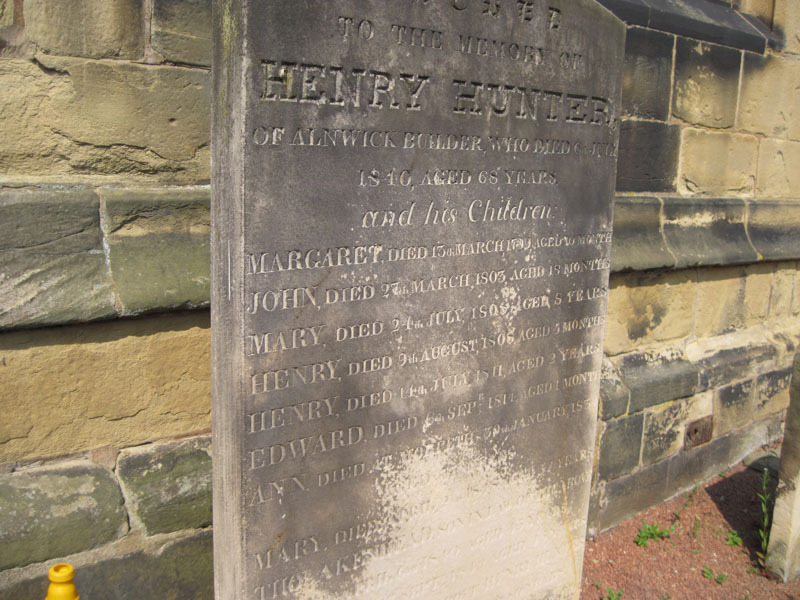 He is mentioned in the multi volume History of Northumberland at the local Alnwick library as is an earlier Matthias Hunter in the late 1500’s, but he hasn’t been found in local parish records, which may mean he was born elsewhere. He probably appears in other town records from the period, but they are not readily availability to the public. He may be mentioned in material held by the current Duke of Northumberland in his library at Alnwick castle and there may also be a local Alnwick or Northumberland historian that can provide information about him. Five other Hunters are found in the cemetery. 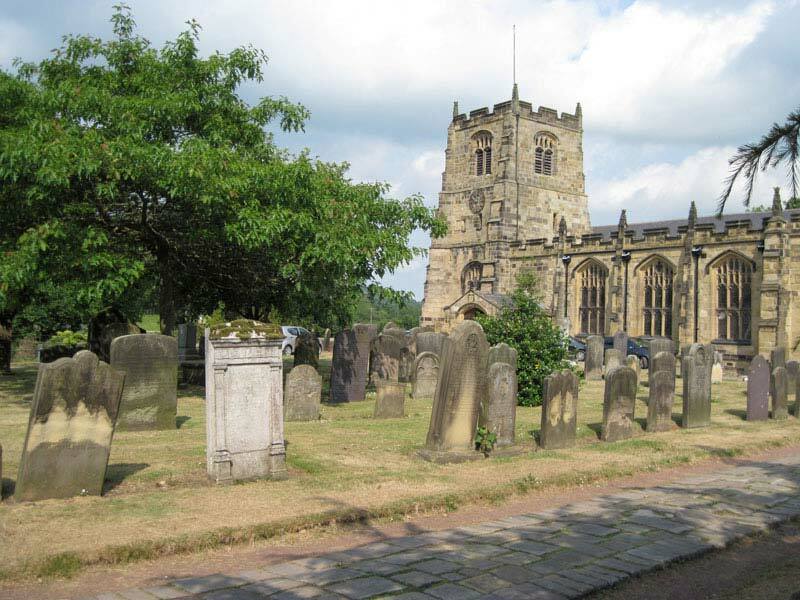 There are at least five Hunter tombstones at St Michaels Parish Church in Alnwick, Northumberland. In addition to that of Matthias Hunter inside the church, there are two on existing Hunter graves and two stones that seem to be randomly placed in the cemetery. All are at least partially readable but several have weathering that partially obscures the inscription. Dr John Mitchell Hunter* (b 1838 Alnwick) developed several advanced tourniquet techniques during service in the Royal Navy. He died (apparently unmarried) near London in 1879 after setting up a private practice. His obituary appears in British Medical Journal May 10, 1879. A local Alnwick obituary stated that the family “was a very old one in Alnwick, many generations having been freemen of the Borough.” The family home still exists on Fenkle and Narrowgate Steets and a female descendant of Robert Sr. and his 2nd wife now lives in Canada. Male descendants of Robert Sr may still live in UK, though not in Alnwick. This stone sits at the back of the church. It stands upright but does not appear to be on a grave. Multiple children and dates are listed. It’s the largest of Hunter stones and the most easily read. 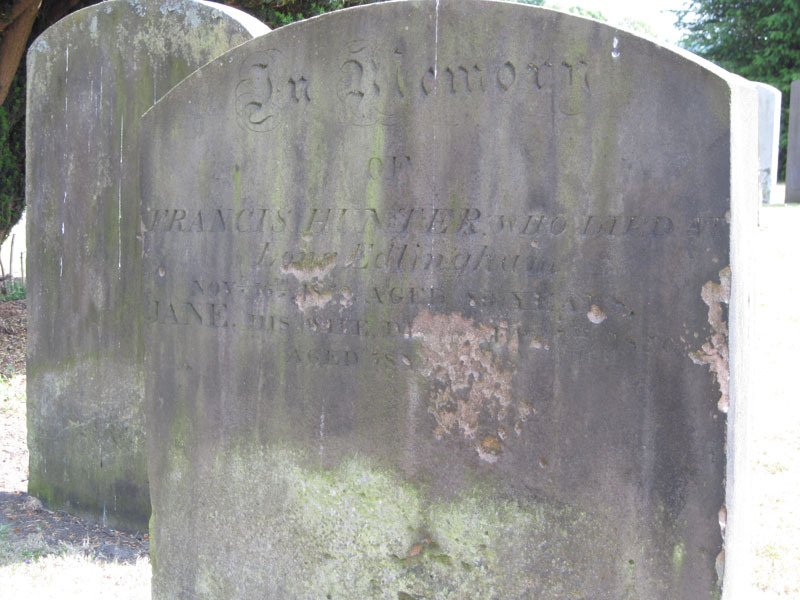 Francis Hunter who died in Edlingham Nov 16 1869 Jane his wife aged… . Facing Henry, a few feet away. Edlingham is a town about ten miles north of Alnwick. 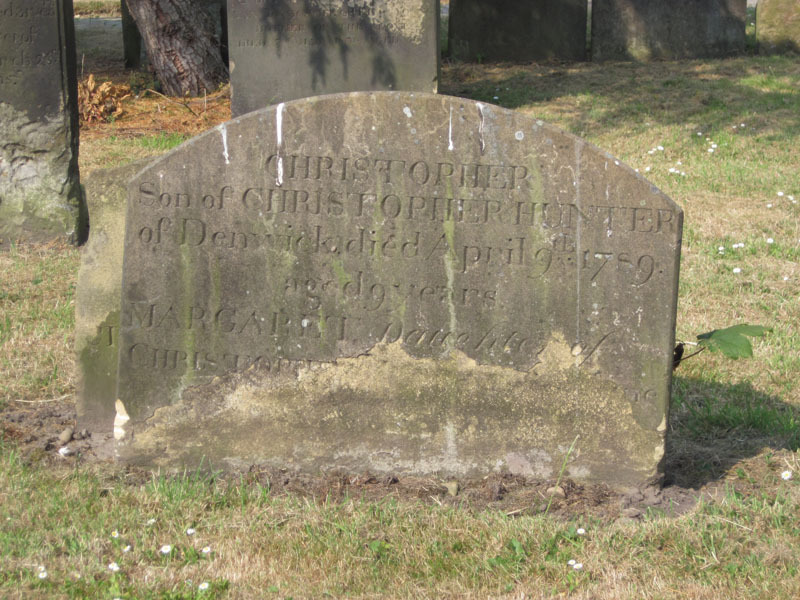 Christopher son of Christopher Hunter of Denwick died April 9 1789 aged 9 years Margaret daughter of Christopher ….. This marker is leaning against an apparently unrelated one. There is no unmarked grave nearby. Denwick is a village just east of Alnwick. 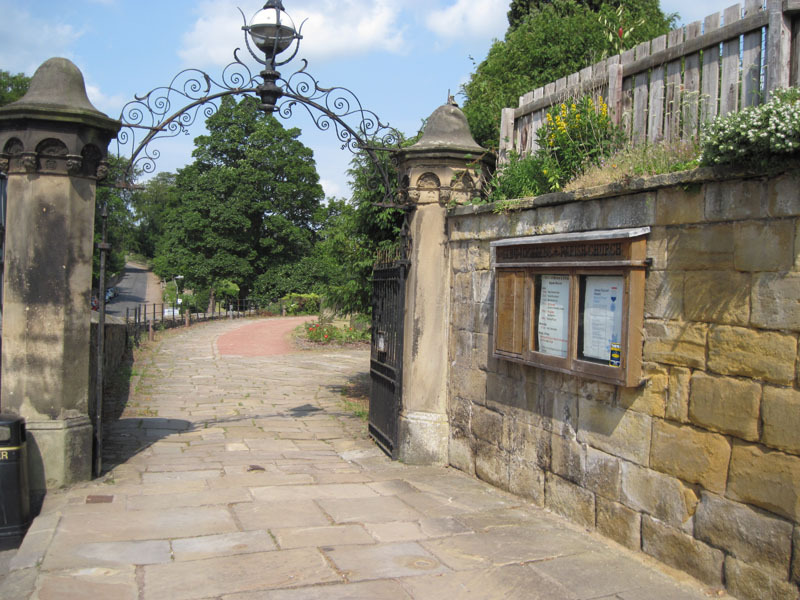 Alnwick takes great pride in the church and the cemetery. There are communal efforts for up keep of the yard and cleaning of the stones. The church is beautiful and is well worth a visit. It is open for visitation midday, 7 days a week and the cemetery is open during daylight hours. The docents are extremely friendly and helpful, but were not immediately aware of the Matthias Hunter gravesite. Photographs are encouraged inside and out. 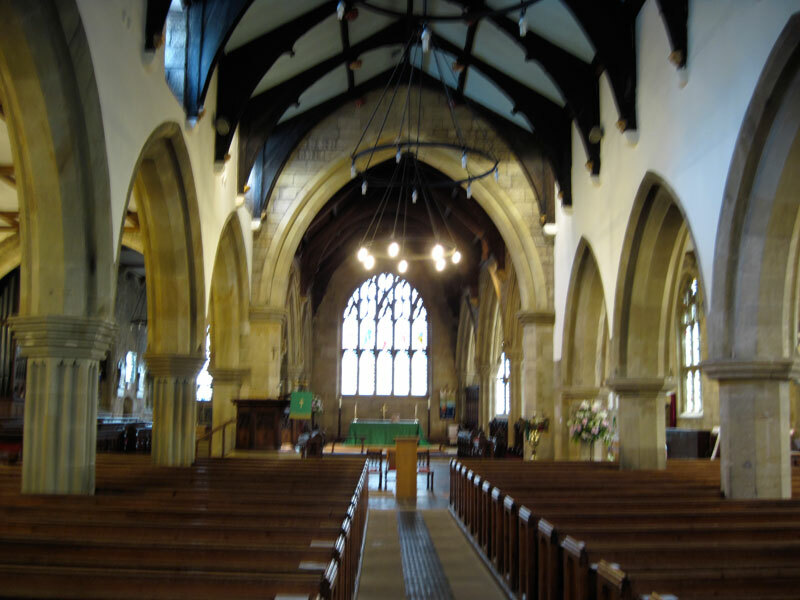 Visitors are welcome for all services, held at least twice daily. There is a small gift shop and donations are accepted. * Not to be confused with John Hunter, MD (1728-1793) who was born at Long Calderwood, East Kilbride, south of Glascow and died in London. This John Hunter is considered the “father of modern surgery” (Moore, W. (2005). The Knife Man: The Extraordinary Life and Times of John Hunter, Father of Modern Surgery. NY: Broadway Books). The possible relationship between these two Hunters is unknown at this time.